About 50 km from the capital of Manila (pop 1,652,171, urbanised area 22 million+) lies Taal Volcano, near the middle of the 25 to 30 km wide Taal Caldera which was formed by a series of very large eruptions between 140,000 – 5,380 BP, the last of which has been identified as a VEI 6 (GVP). Each of these eruptions created extensive ignimbrite deposits, which extend into present-day Manila. The visible volcano is known as Volcano Island and has a large crater lake 1.9 km in diameter. It sports no less than 47 craters and 4 maars. Taal is frequently active, several million people live within a 20-km radius of its caldera rim, and it is surrounded by well-utilized infrastructure. Based on its complex and little-understood eruptive history and its enormous potential for disaster, Taal was chosen as a Decade Volcano by the Philippine Institute of Volcanology and Seismology, PHIVOLCS, from among 200 potentially active volcanoes in the Philippines. That it is part of the current Decade Volcano program does not preclude it from being included in our proposal for a new Decade Volcano Program. After Mayon, Taal is considered to be the most active volcano in the Philippines with 33 historical eruptions, i.e. since the Europeans arrived towards the end of the 16th Century, the first entry being dated 1572. Because of its proximity to the capital and being part of the Decade Volcano program, Taal is by now at least somewhat studied, reasonably well monitored and there are clearly defined hazard mitigation and emergency plans in place. 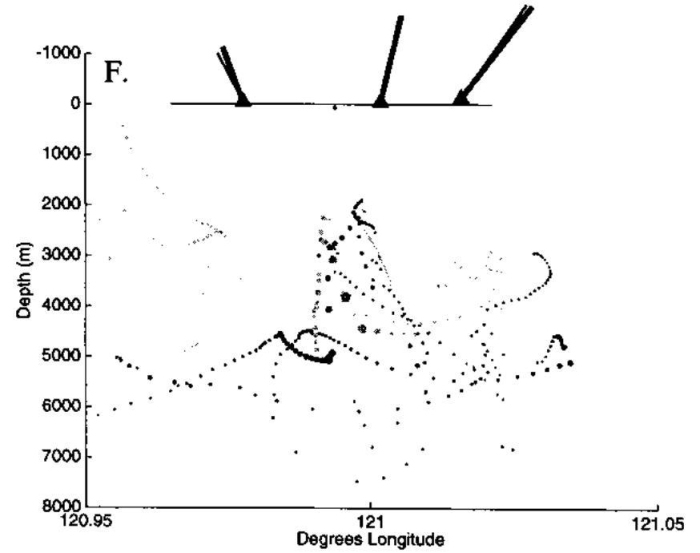 b) There is no observable pattern within these clusters as the first produced four VEI 3 eruptions (= catastrophic), the second began with several explosive eruptions (VEI 2), had a cataclysmic (VEI 4) one in the middle after which there were again explosive ones and the cycle ended with two further cataclysmic eruptions. The third cycle had only three explosive eruptions while the fifth began with a cataclysmic eruption after which the eruptions declined in size. Thus we have two different types of VEI 4 eruptions; plinian in 1754 and phreatomagmatic in 1749 and 1965. As the 1911 VEI 3 eruption is classed as phreatic we can conclude that there is little or no correlation between repose time, type of activity or size of the eruption. This volcano is utterly unpredictable. PHIVOLCS lists six types of volcanic hazards in association with Taal, the greatest threat being that of (pyroclastic)base surges. This is not surprising as it’s a known fact that not only does water reduce friction; a pyroclastic flow rides on a cushion of steam as it were. Also when over water, pyroclastic flows seem to pick up energy and move both faster and much further than on land. Not only is Taal located in the middle of a very large body of water, historically its pyroclastic flows have traversed the entire width of Taal caldera to wreak havoc on settlements on its shores repeatedly. In his account of the founding of Taal in 1572, Fr. Gaspar de San Agustin tells us that in Lake Bombon (Lake Taal) “there is a volcano of fire which is wont to spit forth many and very large rocks, which are glowing and destroy the crops of the natives.” Not only did Taal have a VEI 3 eruption that year, the wording of the document leaves little room for doubt that Taal had behaved in very much the same manner before the Europeans arrived as it did after. Here we have an eyewitness account of pyroclastic flows travelling on the lake (but most likely not reaching the shore as will be evident when we take a look at the evacuation plans of PHIVOLCS) as well as seiches and flooding plus lakeshore landslide (numbers 1, 4 and 5 on PHIVOLCS hazard assessment). …dawn, and we saw the immense column of smoke which rose from the summit of the island, while several smaller whiffs issued from other openings. I confess that the spectacle, far from frightening me, rather delighted my eyes, especially when I noticed that also from the water there rose enormous columns of sand and ashes, which ascended in the shape of pyramids to marvellous heights and then fell back into the lake like illuminated fountains. During these terrible convulsions of the earth fissures opened in the ground amid horrifying roars, said fissures extensing from the northern and northeastern beach of the lake as far as the neighbourhood of the town of Calamba. Here as well as elsewhere, the whole shore of Lake Bonbon has been disturbed. The entire territory of Sala and part of that of Tanauan have been rendered practically uninhabitable – the water courses have been altered, former springs have ceased to flow and new ones made their appearance, the whole country is traveres by fissures, and extensive subsidences have occurred in may places. Although PHIVOLCS categorises this VEI 4 eruption as “phreatomagmatic”, the friar’s description fits more closely with another type of eruption, intermediary between the strombolian and plianan eruptions of this volcano; peléean. The most important characteristics of a Peléan eruption are the pyroclastic flows which Father Buencuchillo describes so well. The heavy explosions that hurl pillars of ash high but as the force is intermittent and not continuous, they fall back down to form pyroclastic flows and with Taal so close to water (it’s elevation is only 311 m at present), the result is a base surge. 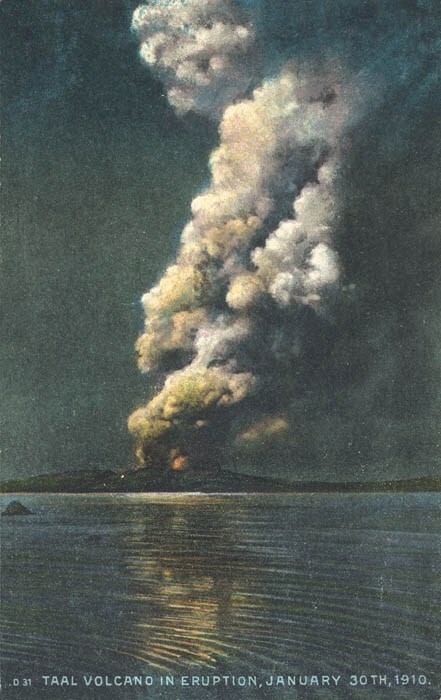 On May 15, 1754, at about 9 or 10 o’clock in the night, the volcano quite unexpectedly commenced to roar and emit, sky-high, formidable flames intermixed with glowing rocks which, falling back upon the island and rolling down the slopes of the mountain, created the impression of a large river of fire. During the following days there appeared in the lake a large quantity of pumice stone which had been ejected by the volcano. Part of these ejecta had also reached the hamlet of Bayuyungan and completely destroyed it. The volcano continued thus until June 2… … From the said 2d of June until September 25, the volcano never ceased to eject fire and mud of such bad character that the best ink does not cause so black a stain… …During the night of September 25, the fire emitted was quite extraordinary and accompanied by terrifying rumblings. The strangest thing was, that within the black column of smoke issuing from the volcano ever since June 2, there frequently formed thunderstorms, and it happened that the huge tempest cloud would scarcely ever disappear during two months. At 7 in the evening of November 28 occurred a new paroxysm, during which the volcano vomited forth such masses of fire and ejecta that in my opinion, all the material ejected during so many months, if taken together, would not equal the quantity which issued at the time. The columns of fire and smoke ascended higher than ever before, increasing every moment in volume, and setting fire to the whole island, there being not the smallest portion of the latter which was not covered by the smoke and the glowing rocks and ashes. All this was accompanied by terrific lightning and thunder above, and violent shocks of earthquakes underneath. The cloud of ejecta, carried on by the wind, extended itself toward west and south with the result that we saw already some stones fall close to our shore. I, therefore, shouted to all those who were still in the town to take to flight and we all ran off in a hurry; otherwise we would have been engulfed on the spot; as the waves of the angry lake began already to flood the houses nearest to the beach. Having reached a secure place on elevated ground at a distance of about half a league (2 kilometers) from the town… …(The volcano) still continued in full fury, ejecting immense masses of material. Now I also observed that the earth was in continuous, swaying motion, a fact which I had failed to notice during the excitement and fear of the flight. Shortly afterwards the volcano suddenly subsided almost suddenly; its top was clear and apparently calm. We, therefore, returned on the following day, the 29th, to the town with the intention of surveying the havoc wrought during the preceding night. Between 3 and 4 o’clock in the afternoon of the said 29th, it began to rain mud and ashes at Caysasay [12 miles from the volcano] and this rain lasted three days. The most terrifying circumstance was that the whole sky was shrouded in such darkness that we could not have seen the hand placed before the face, had it not been for the sinister glare of incessant lightning. Nor could we use artificial light as this was extinguished by the wind and copious ashes which penetrated everywhere. All was horror those three days, which appeared rather like murky nights and we did not occupy ourselves with anything but see to it that the natives swept off the roofs the large quantities of ashes and stones which kept on accumulating upon them and threatened to bring them down upon us, burying us alive beneath their weight… …To all this was added incessant thunder and lightning, and it really looked as if the world was going to pieces and its axis had been displaced. Thus the beautiful town of Taal remains a deserted wilderness and reduced to the utmost misery, while once it was one of the richest and most flourishing places. In the villages to the west of the lake, which were the greater and better part, all the houses have either collapsed under the load of material which had been piled upon them or have disappeared completely, swept away by the waves which in these places were so violent that they dug three ditches or channels, too wide and deep to be forded, and thus rendered impassable the road which joins the town with Balayan. In other parts of the lake shore have likewise opened many cracks and occurred very extensive slides. The worst of all is, that, the mouth of the river Pansipit having been blocked, the lake is rising and invading the towns of Lipa and Tanauan, both being on the lowest level, and inundating their buildings. All the animals of whatever kind have perished, some by being burried, others by drowning, the rest by starving, as not a green blade remained anywhere. 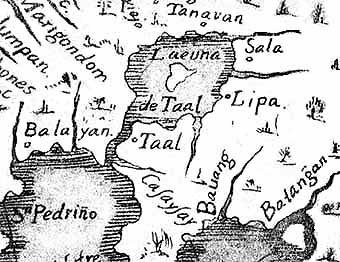 The same fate as Taal has befallen the towns of Lipa, Tanauan, and so much of Sala as still existed. Two and half centuries on, the words of the long-dead clergyman paints a most vivid picture of this great eruption of Taal. From May 15th to June 2nd, the eruption can be characterised as strombolian. On June 2nd, Taal shifted gear and the eruption turned vulcanian, a phase that lasted until September 26th, after which the volcano temporarily quieted down. On November 1st, Taal resumed its vulcanian eruptions but as the friar reports, it was much stronger, probably peléean or bordering thereon. Then on November 28th came the main, plinian eruption which lasted until the next day after which there was a short interlude before it resumed, this time in the peléean manner and continued for another couple of days. The length of the eruption, the havoc and damage wrought at distances up to 20 km, where the ash layer was 110 cm thick, and beyond makes this writer question whether the assignment of VEI 4 to this eruption is indeed correct. At the town of Taal, 10 km distant from the volcano where the modern city of St Nicholas is now built, the ash was 2.20 m thick. An approximation assuming a zero-distance thickness of 3.5 m (in reality, this ought to be much greater) gives a figure in the region of 3.3 cubic km distal ash for a DRE of 0.66 km^3 of magma erupted as ash. Another way to look at it is that 2½ weeks of continuous strombolian eruptions would produce on the order of 0.01 – 0.05 km^3, almost four months of vulcanian eruptions would yield somewhere around 0.2 to 0.5 km^3 to which we must add an eruption that from the friars description at the very least approaches that of Vesuvius’ 79 AD eruption. Thus we end up with a relatively modest guesstimate in the region of 2 km^3 DRE. Whichever way one looks at it, this eruption was easily a VEI 5 and definitely not a VEI 4 as it has been characterised as. Having established that, we need to look at two of the other eruptions; those of 1911 and 1965 as they are officially used as type cases when it comes to hazard assessment and evacuation plans. 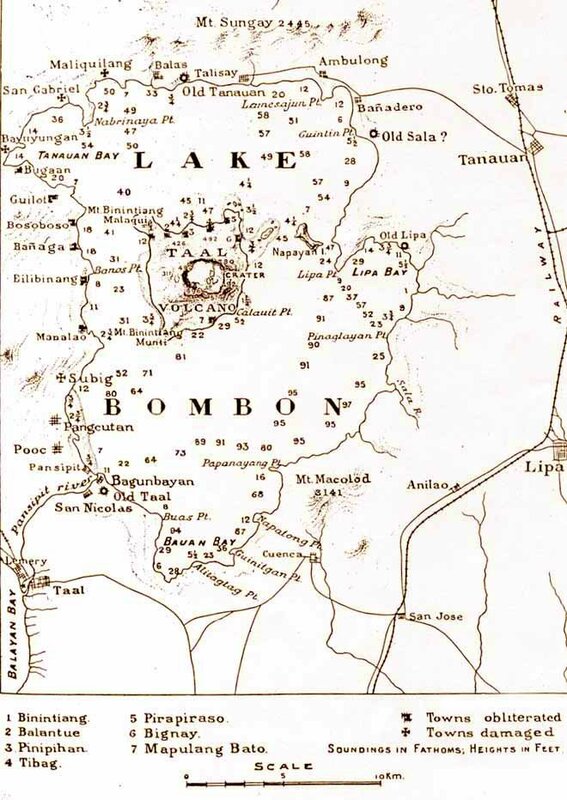 Map which shows how some of the towns around Lake Taal have been relocated as a result of, primarily, the great eruption of 1754. It appears to be certain that the explosions began to assume a terrific violence at 1 o’clock in the morning of the 30th. Shortly after 2 a. m. the volcano burst forth with frightful energy. 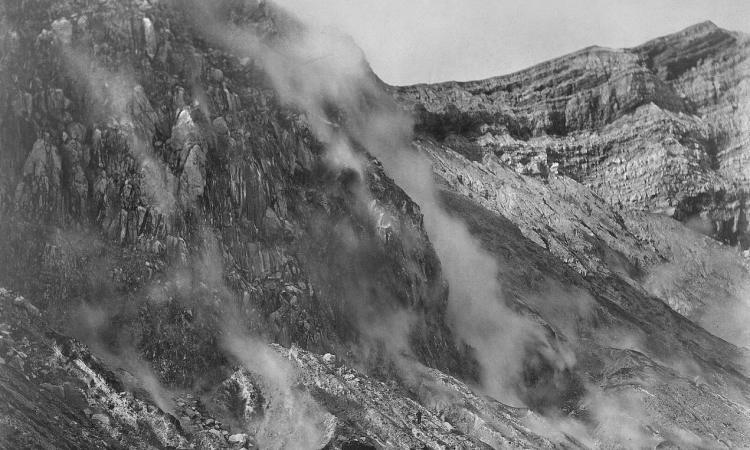 A terrible roar which seemed to be at the same time subterraneous and in the air and could be heard in all directions from the volcano up to distances exceeding 500 kilometers, filled with fear even the people of Manila, though 63 kilometers from the crater. At the same time there was seen an immense, threatening, black cloud, crossed by brilliant flashes of lightning and illumined by local explosions resembling globular lightning, the whole accompanied by peals of thunder for the space of half an hour. This tempestuous cloud must have risen to an enormous height, since it was observed from distances of some 400 kilometers, where it was mistaken for a distant thunderstorm. People living in towns at some distance from Taal, but having it in full view, noticed that there were two or three explosions in succession and that the electric discharges took place almost vertically within the column of smoke, striking upward from the mouth of the crater. A calculation yields an absolute minimum height of 13 km for the eruption column to be even marginally visible above the horizon at 400 km distance, hence it would be safe to assume a true value in the region 15 – 20 km making this eruption plinian although PHIVOLCS has categorised it as phreatic. Of what happened in the villages which have been wiped out of existence by this eruption, we have at best vague information, which we may supplement by conjectures as to what must have occurred. One of the survivors narrates that he and his son were sleeping in their shack when they were awakened by violent explosions accompanied by vivid flashes. The son went to the door and dropped dead; in the the same instant the father found himself covered by dust and scalding mud against which it was impossible to protect himself, as it was entering through every crevice of the house. He cowered down in a corner as best he could until the tempest was over, when he found himself still alive, yes, but with his whole body scalded and horribly burned, especially in the face and other parts not protected by the clothes… …The mud not only scalded on account of its high temperature, but produced true burns due, no doubt, to caustic substances which it contained. The physicians who attended the injured attribute to these latter the great depth of the wounds and the condition of the surrounding tissue, which was altered much more than is usual in cases of simple scalding by boiling water. The plants—even up to distances of 10 kilometers from the volcano—showed parts whose colour and consistency indicated real carbonization. In general it may be said that the destruction of vegetation is likewise evidently due not so much to the scalding effects of the mud as to chemically active substances in its composition. The chief feature of the eruption seems to have been a terrible explosion which with incredible violence hurled high up into the air and scattered in all directions glowing rocks, earth, mud, ashes, and gases. As if shot from the mouth of a gigantic cannon, this death-dealing mixture mowed down or destroyed whatever it encountered in its path on the entire island and on the neighbouring western shores of Lake Bombon. It cut down or uprooted trees and other plants, destroyed houses, and killed well-nigh every living being within a radius of 5 to 6 kilometers to the east of the crater, and up to more than 15 kilometers to the west thereof. Everything remained covered with a thick layer of volcanic products which, obliterating the smaller details of the ground, gives to the devastated region an aspect gloomy beyond description. 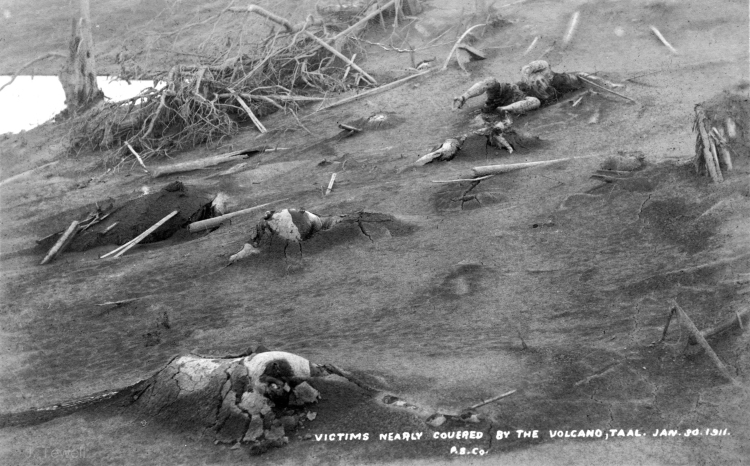 Of the 1,300 victims who perished in the 13 small barrios—some on Volcano Island itself, others on the western shore—many were killed in the act of fleeing; others were found buried underneath or among the debris of their huts which had been brought down upon them and torn to pieces, being partially covered with rocks and mud; some seem to have been killed by instantaneous asphyxiation, as they were found on their mats in the attitude of peaceful sleep. The area of destruction consists of a central portion and an outer zone. Within the former, the devastation was complete. This central area has the shape of an ellipse whose major axis, about 20 kilometers long, lies in the direction ESE-WNW, while the minor axis, in the direction NNE-SSW, measures some 12 kilometers, the volcano occupying the eastern focus. Within this area lie Volcano Island and the western shores of Lake Bombon, which are the closest to the volcano. The exterior zone, within which the destruction was only partial, surrounds the central portion in a width of about 5 kilometers. The extreme limits to which the rain of mud and ashes ruined a great part of the more delicate vegetation, extends closely up to 15 kilometers on the eastern and southeastern side of the lake, 20 kilometers toward west and northwest, and from 25 to 28 kilometers toward north and northeast. The fall of finely divided ashes only, but in quantities sufficient to be seen on roofs and plants and to be collected, reached a distance of 40 kilometers to the north and northeast, and presumably the same on the western side. Photograph of some of the victims of the 1911 eruption. The pugilistic pose of the victim at upper right is typical of victims caught in a pyroclastic flow and is the result of the muscle tissue contracting due to the intense heat. Although the true cause of the burns was misidentified, from this description it is evident that pyroclastic flows from this eruptions travelled more than ten kilometres and still were lethal even if with luck, they were survivable. If we take into account the zone of 100% fatalities that extended 5 – 6 km to the east and more than 15 km to the west, it becomes abundantly clear that this eruption was not a VEI 3 phreatic event but actually a plinian or peléean VEI 4 eruption. The death toll would not have been as high had people not actually lived on Volcano Island, which is one reason why the PHIVOLCS has now made it a Permanent Danger Zone. The only precursors to the September 28th – 30th eruption was a rise in the temperatures of the central crater lake on Volcano Island. During early July 1965, temperatures rose from the 1964 average of 31-33C to 45C on July 21st with temperatures slightly lower at 41C on September 25th. There was no noticeable change in seismic or tilt activity. During the early hours of September 28, eyewitnesses living on Volcano Island described what is a Strombolian eruption, basaltic ejecta erupted from a cinder cone to the side of the main vent. Seismometers (old-fashioned drum plots) recorded strong seismic activity from 02:20 to 09:20. At 03:25, the main explosive phase, which lasted until 09:20, began as water presumably gained access to the volcanic conduit. The main eruption column is reported as reaching an altitude of 15-20 km and at the base a base surge rapidly formed which travelled across the waters of Lake Taal at hurricane velocities. The horizontally moving, debris-laden clouds sandblasted trees, coated the blast side of trees and houses with mud, and deposited coarse ejecta with dune-type bedding in a zone roughly 4 km in all directions from the explosion crater. The eruption opened a new crater 1.5 km long and 0.3 km wide on the southwest side of Volcano Island in Lake Taal. It also covered an area of about 60 square kilometers with a blanket of ash more than 25 cm thick and deposited fine ash as far as 80 km west of the vent. The total death toll from this eruption was approximately 200 people. Additional areas to be evacuated shall be determined based on the development in eruptive style and location of the monitored parameters. Being familiar with the accounts presented in “Actas de Taal”, we immediately recognise that the hazard assessment is in main based on the writings of the friars. Looking at the areas identified as being at risk in case of certain scenarios, we again recognise the “Actas de Taal” as being the principal source. Here, it is logical to ask whether PHIVOLCS have based their assessment of Taal on friars’ accounts or on the results of scientific research because there is no sign of the latter in the information published by PHIVOLCS on their official site. At this point we must realise that the Philippines is not a rich country, that resources for volcano monitoring and volcanology research are limited. 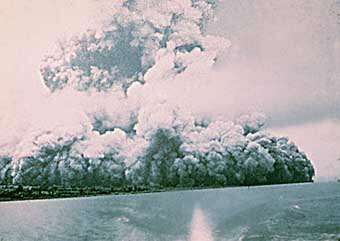 As an example, the 1965 eruption destroyed the (drum plot) seismometer based on Volcano Island and that the remaining record comes from the seismometers based on the northern shore of Lake Taal and in Manila. 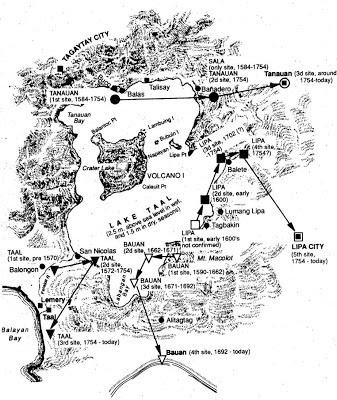 A network of continuous single- and dual-frequency GPS receivers at Taal Volcano was not installed until June 1998. So what do you do with millions of people living within the danger zone and further tens of millions within 50 km? You do exactly what PHIVOLCS has done! Your first priority is to protect people, thus you first take a look at the historical records available in order to establish what the volcano can do. As it turns out the volcano in question is utterly unpredictable, you have to make contingency plans based on the more likely alternatives. Also, these have to be palatable to those you report to, hence the official downplaying of certain eruptions which is made for public consumption! The bottom line is that as long as Taal does not exceed what it has done historically, PHIVOLCS have excellent hazard mitigation and contingency plans in place, supported by adequate monitoring systems. But it is not what Taal has done that is of interest to us but what it can potentially do. Taal is a complex volcano located at the intersection of the northerly-trending west Luzon calc-alkaline volcanic arc and the “Macolod Corridor”, a cross-arc lineament comprised of andesitic complex volcanoes and monogenetic basalt cones and maars, located on the Philippine Mobile belt, which means there is a prodigious amount of juvenile magma accessible. In the past, it has undergone a series of very large (VEI 6 or greater) eruptions that have gouged out Taal Caldera, 25 by 30 km wide. Ignimbrite deposits from each of these eruptions have reached into present-day Manilla, more than fifty kilometres from the volcano. Although one paper (Listanco, 1994) gives a period of 500 to 100 kA BP for its formation, more recent figures places this period between 140,000 – 5,380 BP and the GVP lists the final of these eruption. From a geological point of view, 5,000 years ago is yesterday and the precise dates, start and finish, are much too glib and likely – or possibly even designed to – induce a false sense of security. There is no way anyone can say, with any degree of scientific verisimilitude, accuracy or certainty that the caldera-forming era of Taal ended 5,380 BP +/-200 years. To do this requires in-the-field, in-depth scientific studies that to date have not been undertaken. Before they are, it is only prudent to take into account the possibility of VEI 6 – or possibly greater – eruptions occurring at Taal in the near, human time-scale, future. 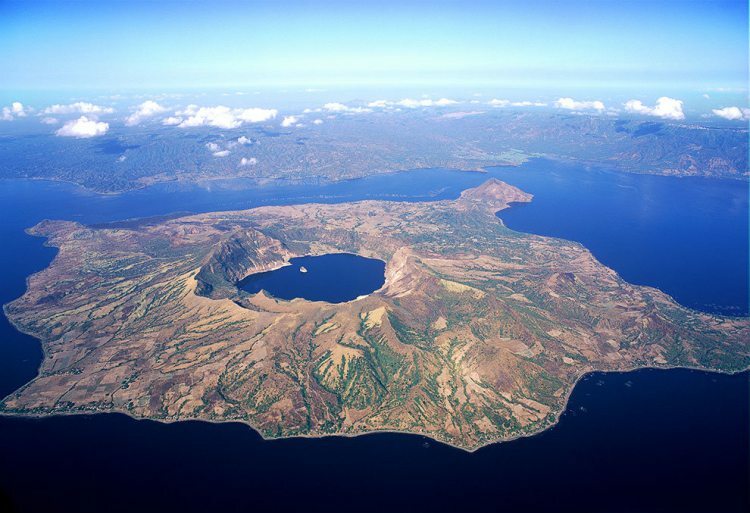 Taal is a restless caldera as has been discovered subsequent to the installation of a GPS network in 1998. Lowry et al report up to 50 mm of horizontal motion directed toward the summit crater lake and as much as 80 mm of subsidence for the period 1996-8, apparently resulting from deflation following the 1992-4 crisis. In May of 1998, a network of three continuously recording GPS stations was installed on Volcano Island. Over the following year, small but significant changes were recorded, 30 mm in the horizontal and 50 mm in the vertical for sites on Volcano Island. During June and July of 1999, the GPS network was augmented with a dozen single-frequency GPS stations: an additional seven on Volcano Island, and five on the caldera rim. 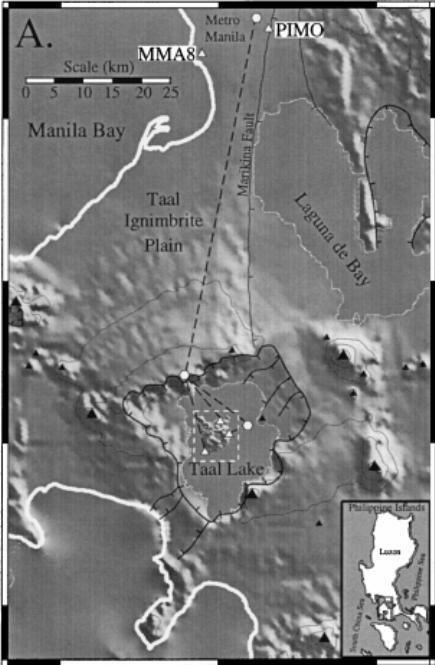 Subsequently, the largest displacements occurred during the February–November 2000 period of inflation, which was characterized by 120 mm of uplift of the centre of Volcano Island relative to the northern caldera rim at average rates up to 216 mm/yr. It is noteworthy that this research was funded by US National Science Foundation grants. 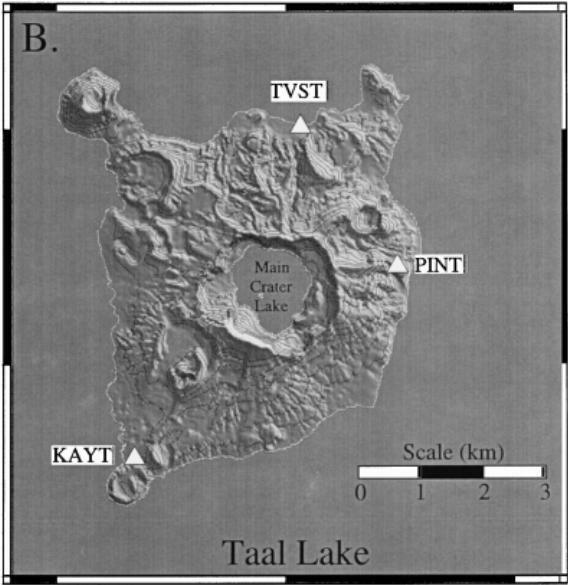 Following this research, a model has been proposed for Taal (Lowry et al: 2000) where there is a hydrothermal zone at ~2 to 7 km depth below Taal and that the periods of inflation can be related to the intrusion of magma into this reservoir. A plot of their data suggests that this area may be about 1 km across at 2 km and about 2 km at 5 km depth. Other research (Besana et al., 1995) has identified a ~15% reduction of shear wave velocity at 18 km depth beneath the northern caldera rim, interpreted to indicate partial melt at that depth. Should this turn out to be related to the magmatic system that directly feeds Taal / Volcano Island, the implications are grave. From other restless calderas, we know that the onset of eruption can be very rapid from the first signs and that even the relatively small eruptions caused yet have devastating potential if they occur in the wrong spot. In 1538, Campi Flegrei had the VEI 3 Monte Nuovo eruption after less than 72 hours of uplift that totalled over 6 m. In 1994, the stratovolcanoes Tarvurvur and Vulcan on opposite rims of the Rabual caldera erupted simultaneously destroying the town of Rabaul (VEI 4) after less than 24 hours of uplift had caused the ground to inflate in excess of six metres. In comparison to these calderas, Taal is even more dangerous because of the amount of water present within its magmatic system and immediately adjacent to it. Another point to be made is that caldera systems which have undergone a full collapse, i.e. that the volcanic edifice has collapsed into the magma chamber, seem to build stratovolcanic cones in an arc around the caldera perimeter. This has not happened at Taal and could be an indication that the Taal caldea is still active and capable of producing further caldera-forming eruptions, more than likely large VEI 6 but possibly even bordering on VEI 7. For these reasons further studies of the Taal Caldera, not limited to its Volcano Island expression, are imperative. As is abundantly clear, these studies have to be funded internationally, hence we have placed Taal Caldera at our number 8. Let’s see whether this works – I was reading up on Taal and getting more concerned with every paper! The main crater seems fairly safe at the moment, blocked up by solidified magma which will take some shifting. At the eastern flank there is an active magma reservoir 5 km down, with the degassing into a region just below the surface. One paper finds a hydrothermal layer of water and vapour 1km down. It sounds very unstable. The next eruption is likely a flank eruption. Just testing I can leave a comment on a restored post. This is a very good read. The documents written by those who experienced what happened grips the heart. Then to see the victims on the picture….. At first I hadn’t noticed where the man inside the Volcano Island’s central crater was. It is certainly huge and what it was like when it erupted must have been horrific.